Drilon Çoçaj started to learn guitar at the age of 7 in the family surroundings, to continue later at Music School “Lorenc Antoni “in Prizren. In 2004 he enrolled in Academy of Arts, University of Prishtina, in the class of the well-known professor Xhevdet Sahatxhija. Under his guidance he also successfully finished the Master’s degree in guitar interpretation. Çoçaj is the Winner of the first and second place in International competition of young musicians “Ars Kosova” in Prishtina. In his carrier he held solo concerts and like a member of various ensambles performed in Sweden, Albania, Kosovo, Montenegro, Germany. 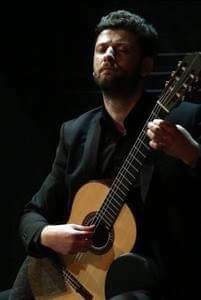 Drilon Çoçaj also participates in a various festivals, such as Guitar Sounds in Tirana, Dam Fest and Re Musica in Pristina, Chopin Festival in Poland, Ulcin Summer Festival etc. He appeared as a jury member at the Ehat Musa Competition in Peja, Ars Kosova in Pristina and the guitar competitions in Tivat, Montenegro. Çoçaj currently works as an assistent in Faculty of Arts in Prishtina, at the music school “Prenk Jakova” in Prishtina, and Music School “Misbah & Friends”. His students are rewarded in various international competitions and he often holds masterclasses in Kosovo, Albania and Sweden.